Lakeside views, nature conservation areas abundant with woods and reeds – and, at the heart of it all, a vibrant town with a long history. 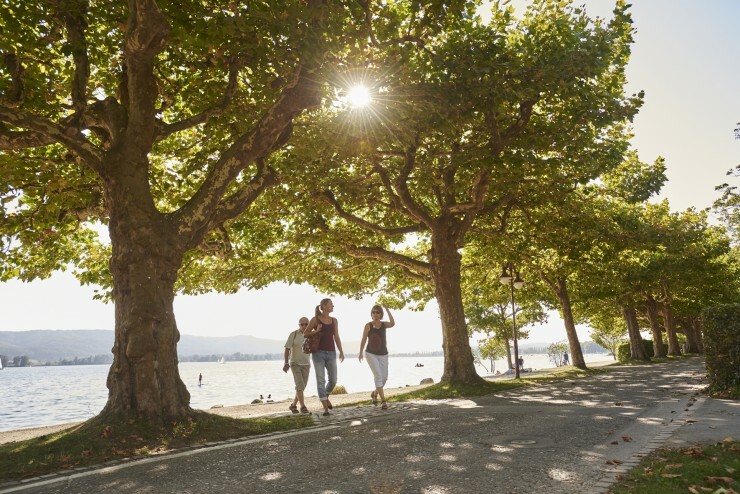 Radolfzell am Bodensee effortlessly combines the tranquillity of the countryside with the buzz of an urban centre. Radolfzell has long been held up as a particularly leafy destination. Back in 1989, the third-largest town on Lake Constance was dubbed Germany’s “secret green capital” by weekly magazine Der Spiegel. 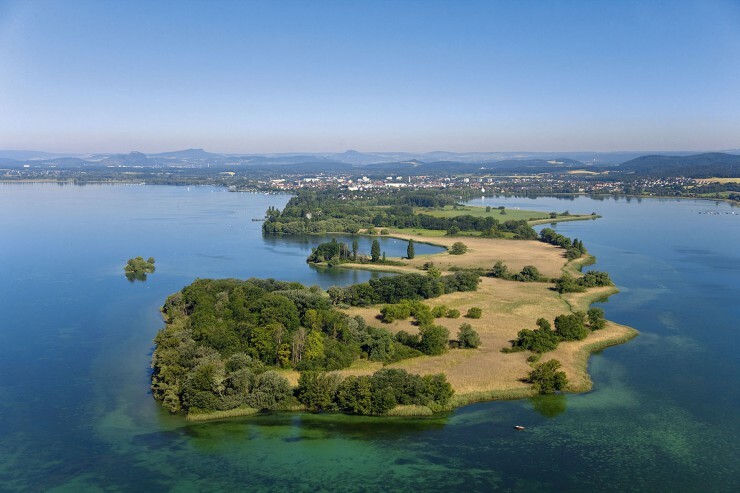 Mettnau peninsula, just a few minutes’ walk from the buzzing old quarter, is one of Germany’s oldest nature conservation areas and an oasis of calm. The far end of the headland is very peaceful, with little besides the odd duck call, the flapping of swans’ wings and – in spring and summer – the chirping of great crested grebe chicks breaking the silence. 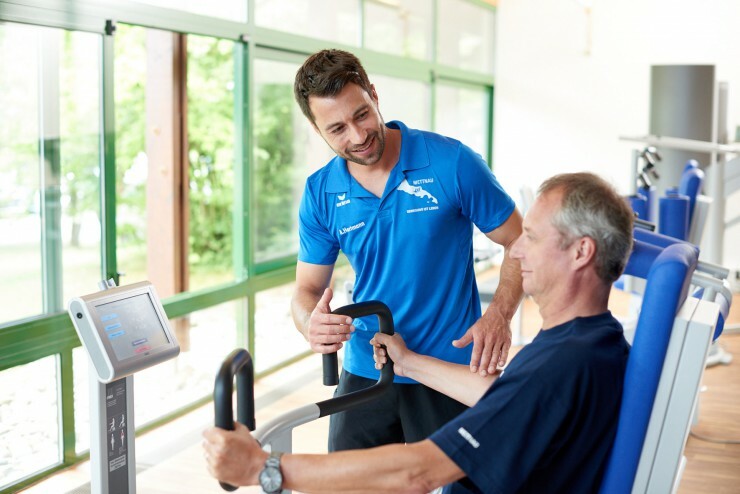 Mettnau is also home to a movement therapy centre of the same name that offers rehabilitation and preventative approaches under the banner Movement is Life. A visit to the bora-Sauna on the shores of the lake is the perfect accompaniment, offering outdoor wellness facilities the whole year round. Separated from the lakeside promenade and moorings only by the railway tracks, the charming old quarter radiates out from the Gothic cathedral and is home to numerous independent shops. 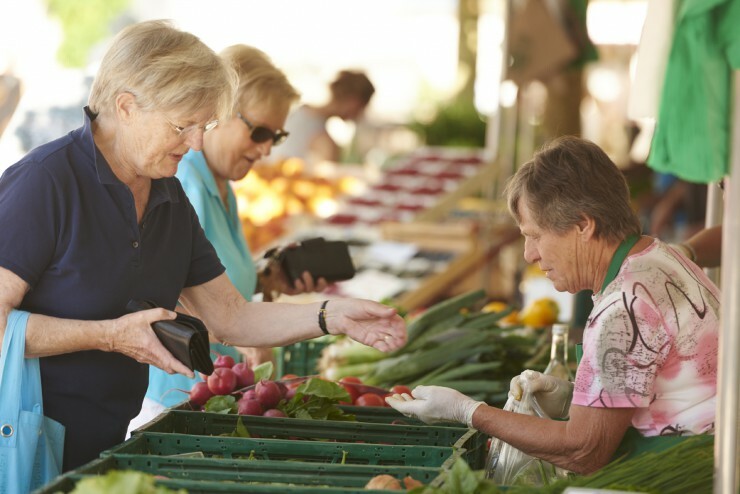 On market days (Wednesdays and Saturdays), in particular, the town and the square next to the cathedral are full of the hustle and bustle of locals visiting the market. 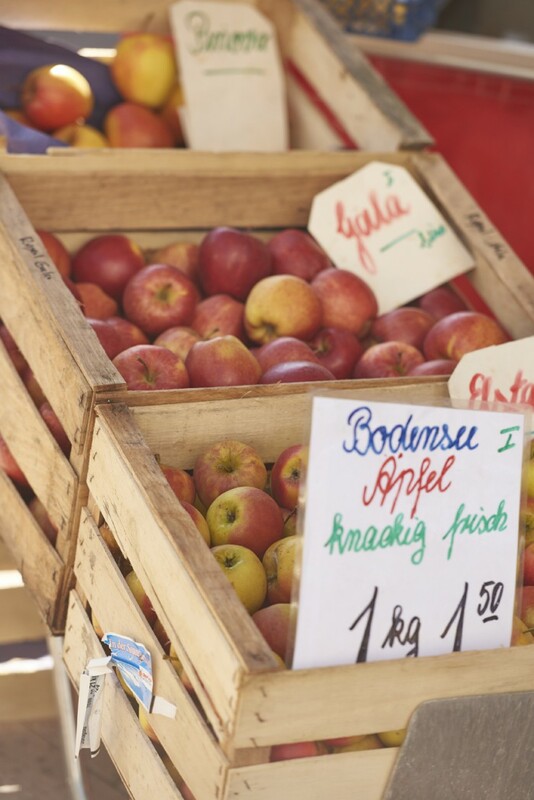 There are stalls selling vegetables and herbs from farms on the nearby Höri peninsula, meat from local butchers and fresh regional fruit and cider. There’s even a stall that sells Italian bread – salted or, as per tradition, unsalted. It’s a popular place for locals and visitors to stop for a cappuccino and watch the world go by. 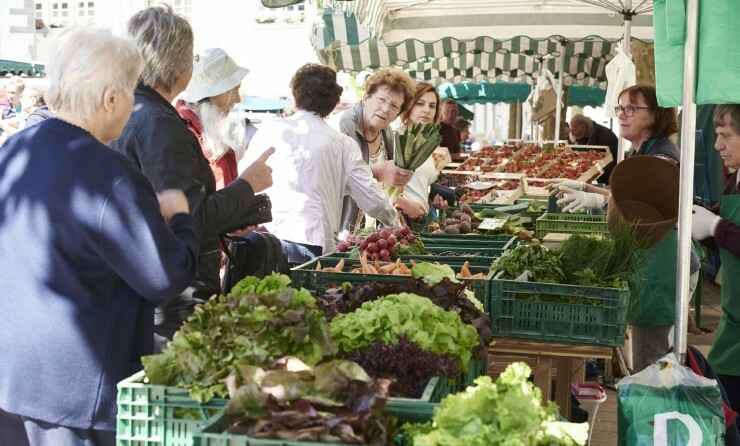 And in the early morning, the market traders meet at Marktcafé for a break. 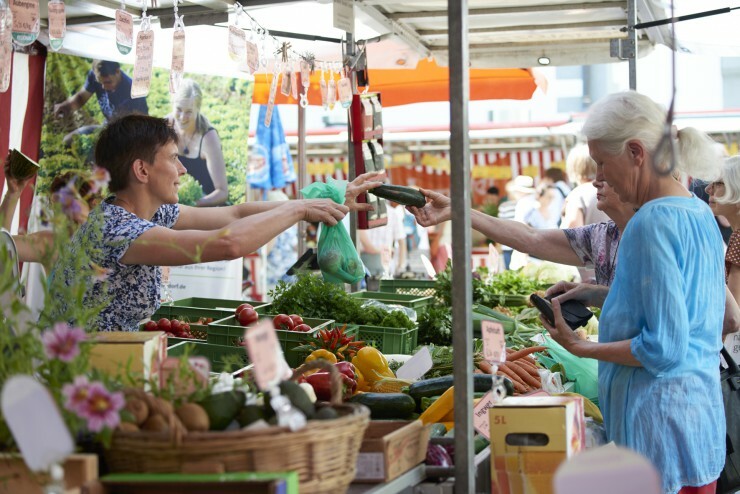 Not to be missed is Radolfzeller Abendmarkt, an evening market that is open on Thursdays between 4pm and 9pm during the summer months. As well as doing their shopping here, visitors can tuck into the full range of regional specialities, including local fish and the pizza-like dünnele, with a glass of cider or wine – all rounded off with a little musical entertainment. 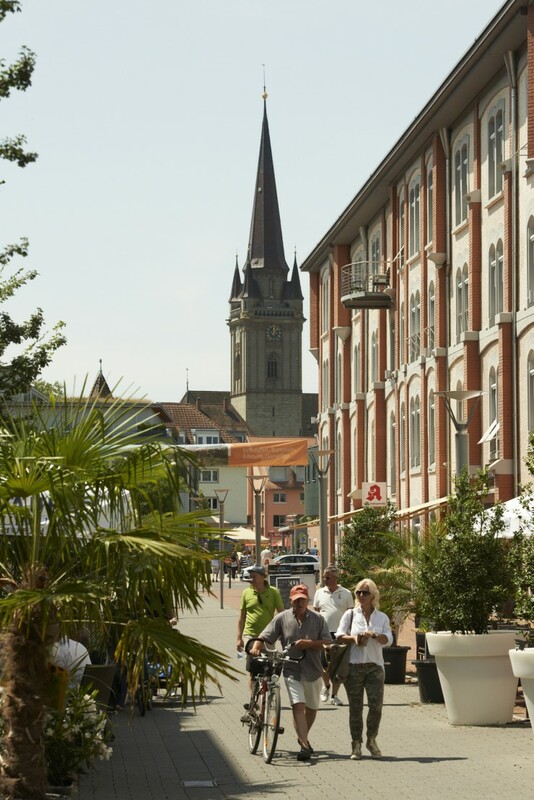 In recent years, the centre of Radolfzell has been transformed into a spacious pedestrian area, and cyclists are welcome as long as they are considerate while passing through. The former factory of underwear manufacturer Schiesser, built in 1900, has been transformed into a thriving business hub called Jahr100bau. This long building was once home to the first mechanical production line for woven fabrics. Today, it provides one of the boundaries of the new pedestrian walk between the old quarter and the seemaxx outlet centre. This shopping oasis houses more than 40 brand-name stores over two floors and features an extensive range of products using the famous ribbed fabric. Right next door to it is the largest climbing centre in the Lake Constance region, offering 2,500 square metres of all-action climbing, bouldering and slacklining. The futuristic solar ferry Helio moves almost silently across the water. 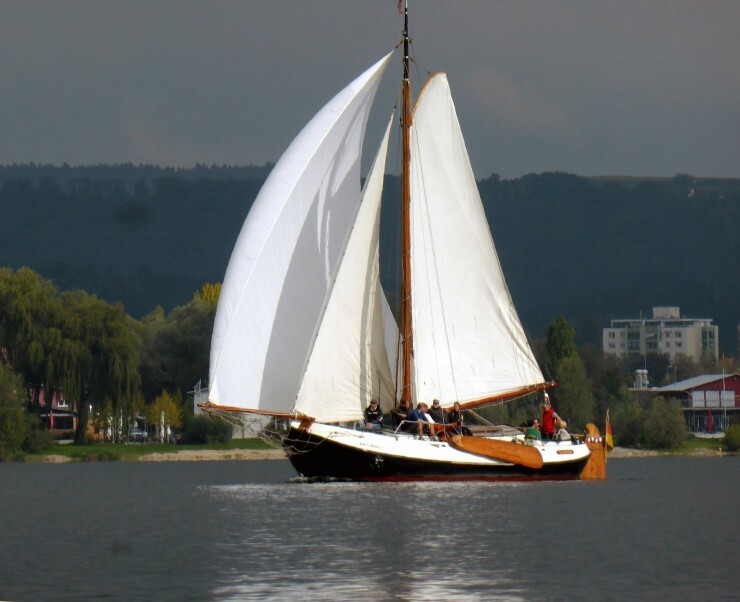 It makes its way from the harbour mooring to Mettnau peninsula powered only by the sun and is perfect for enjoying views across the lake and to the nearby Alps. Reichenau Island and the Swiss shores of Lake Constance are easily reached on one of the scheduled ferries. Cyclists are also welcome on board, making it easy to combine a boat tour and a cycle tour. 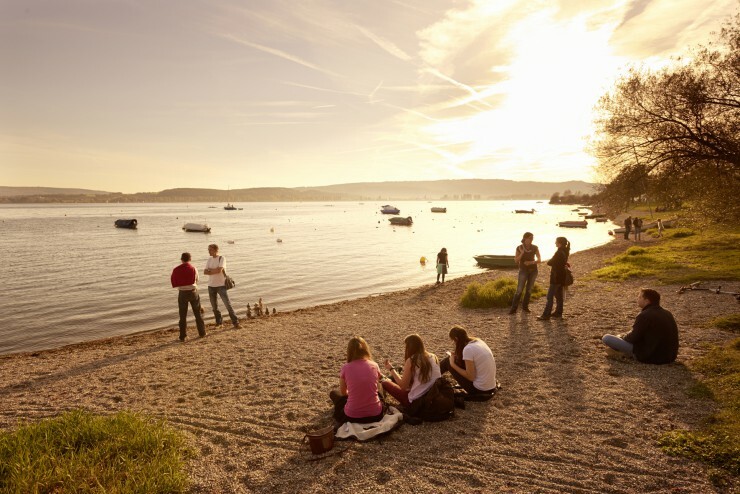 Visitors who prefer to remain on terra firma can take a regional train that whisks them to Constance, Singen or Überlingen in only a few minutes. There are six villages grouped around the town centre, each with their own character and surrounded by nature. They are ideal starting points for walking tours, for example to the small lakes that lie within the boundaries of Radolfzell. 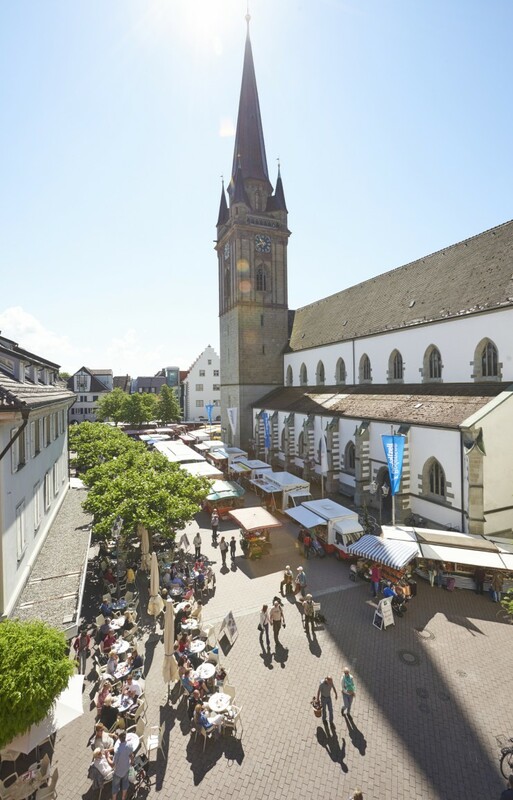 In Markelfingen, for example, visitors can choose between Lake Constance and Lake Mindel. 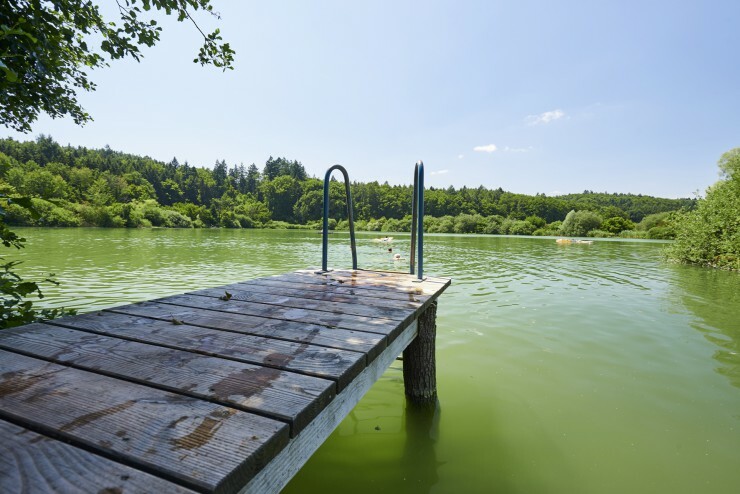 The three Buchen Lakes can be found in Güttingen, while Lake Böhringen in the village of Böhringen was formed by a glacier. The village itself is home to more than 20 breeding pairs of storks, which are the subject of research at the Max Planck Institute for Ornithology in nearby Möggingen. Visitors to the institute’s ‘Hennhouse’ will be amazed by the 360-degree projections that present fascinating facts about bird migration. Stahringen lies at the foot of the medieval castle ruins of Homburg, and Liggeringen with its scenic views attracts fans of the dünnele. The biggest festival in the calendar is the Hausherrenfest, which is held in honour for the town’s patron saints, Theopont, Senesius and Zeno. It is held every year from the Saturday of the third weekend in July to the following Monday, when the Moos boat procession attracts many visitors to the harbour pier in the early morning. The Alemannic Fasnacht carnival is cause for great celebrations in Radolfzell. It really gets going on the eve of ‘Schmotziger Donnerstag’, the last Thursday before Lent, when the ‘Hemdglonker’ procession invites people to don a nightgown and nightcap and join in the fun. Typical to Radolfzell are the klepperle, small pieces of wood that are used like castanets to make plenty of noise. 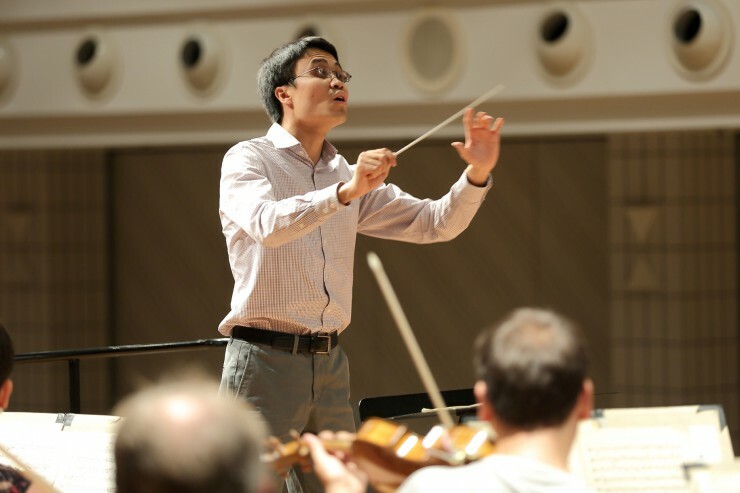 For many years, the International Summer Academy has attracted music students from around the world to Radolfzell, where they hone their talents on the violin, cello and piano in August and in conducting in September. Both locals and visitors to Radolfzell benefit from the fruits of the students’ labour as the courses are accompanied by a number of concerts that make the town come alive with music. 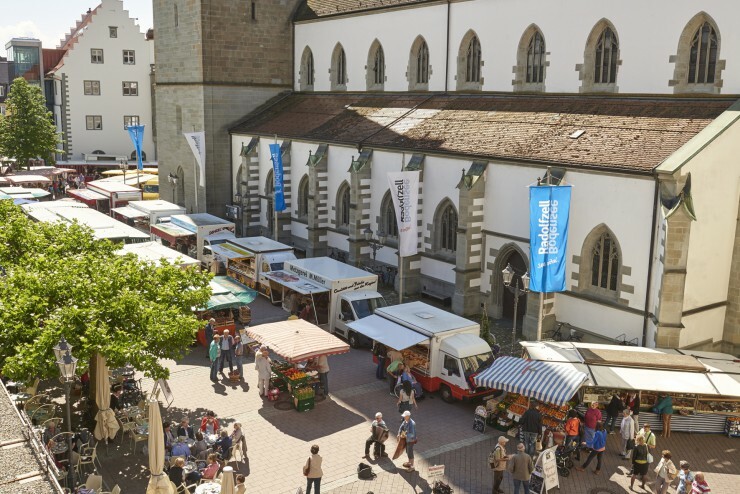 Zweimal die Woche werden in Radolfzell auf dem Marktplatz Stände mit Produkten aus der Region aufgebaut, von Juni bis Anfang September sogar gleich dreimal. Der Abendmarkt, eine Spezialität Radolfzells, findet an zwölf Donnerstag-Abenden statt und hat sich zu einem echten Ausflugsziel entwickelt. Die Mooser Wasserprozession ist einer der Höhepunkte des Radolfzeller Hausherrenfestes, mit dem die Stadt alljährlich ihre drei Stadtpatrone ehrt. Im Jubiläumsjahr findet das Fest vom 14. bis 17. Juli statt. Musikstudentinnen und -studenten aus der ganzen Welt kommen ins malerische Radolfzell am Bodensee, um bei Meisterkursen während der „Internationalen Sommerakademie“ ihr Spiel auf Violine, Violoncello und Klavier zu perfektionieren. In Radolfzell gründete Jacques Schiesser aus der Schweiz im Jahr 1875 seine Trikotagenfabrik. Die Ausstellung fand im Jahr 2017 statt. Besonders an den Markttagen (Mittwoch und Samstag) pulsiert das Leben in der Stadt. Der Marktgang ist für die Radolfzeller ein Pflichttermin. In Markelfingen kann man sich zwischen Bodensee und Mindelsee entscheiden. Zu Güttingen gehören die drei Buchenseen. Der Böhringer See ist ein Gletscherrelikt. Hier im Bild kann man den Steg im Buchenseebad entdecken. 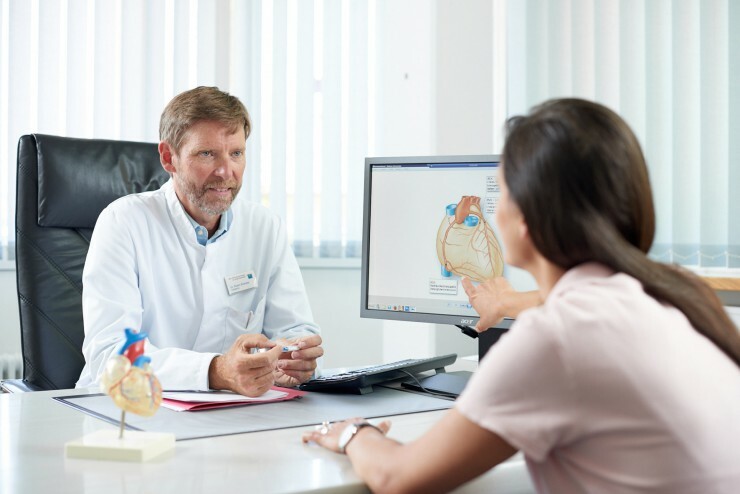 Das traditionsreiche Zentrum für Bewegungstherapie METTNAU bietet sowohl Rehabilitation als auch präventive Kuraufenthalte an. Auf der Halbinsel Mettnau befindet sich das traditionsreiche Zentrum für Bewegungstherapie METTNAU. 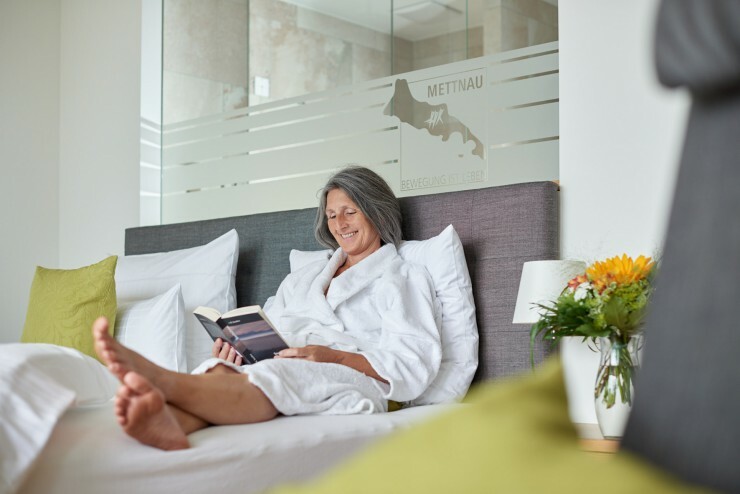 Auf der Halbinsel Mettnau besuchen Reha- und Urlaubsgäste das Zentrum für Bewegungstherapie METTNAU. Nur wenige Gehminuten von der lebendigen Altstadt entfernt findet sich auf der Halbinsel Mettnau eines der ältesten Naturschutzgebiete des Landes. Unter dem Motto „Bewegung ist Leben“ bietet es sowohl Rehabilitation als auch präventive Kuraufenthalte an. Kein anderer Ort am Bodensee kann mit einem so langen begehbaren Uferabschnitt aufwarten wie Radolfzell. 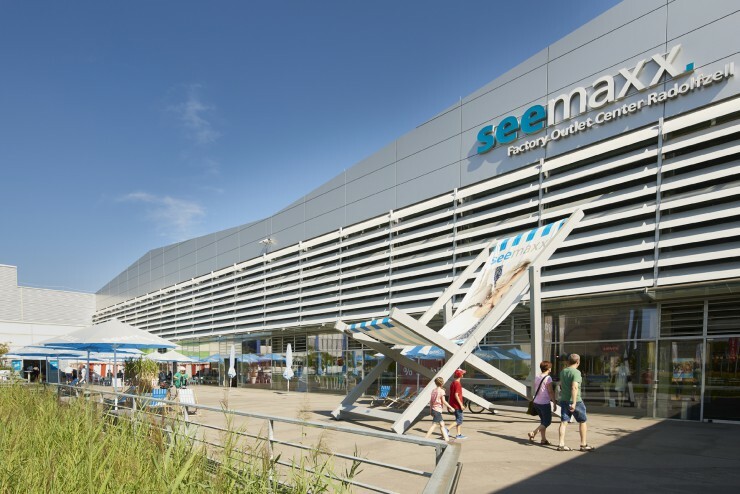 Das Outlet-Center seemaxx verfügt über ein umfangreiches Feinripp-Angebot und über 40 Markenshops. Der Stadtkern von Radolfzell hat sich in den letzten Jahren zu einer weitläufigen Fußgängerzone entwickelt. Ein Spaziergang auf dem Seeuferweg ist ein Muss. Kein anderer Ort am Bodensee kann mit einem so langen begehbaren Uferabschnitt aufwarten wie Radolfzell. Der Schnupperturn auf dem originalen Friesländer Plattbodenschiff der Familie Habenicht bringt richtig Laune. 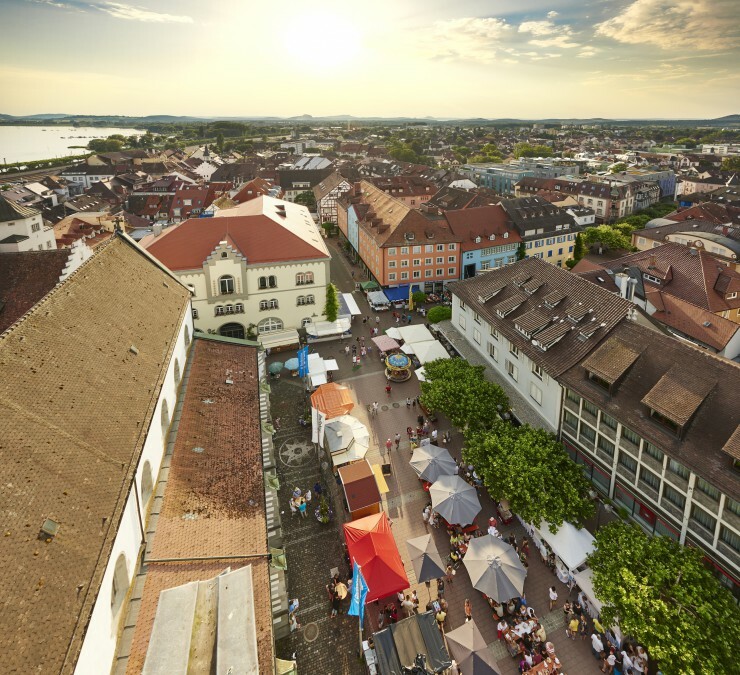 Mit den Gemüsebauern von der Höri, der Reichenau und dem Hegau, die auf dem Wochenmarkt ihre Erzeugnisse anbieten, kommt man an den Markttagen Mittwoch und Samstag ins Gespräch. Das Radolfzeller Markttreiben in der historischen Altstadt, die sich rund um das gotische Münster ausbreitet. Bauern von der nahen Halbinsel Höri und der Insel Reichenau verkaufen Gemüse und Kräuter, Landmetzger ihr Fleisch, es gibt Obst und Most aus der Region. Einzigartig ist der Radolfzeller Abendmarkt, der in den Sommermonaten immer donnerstags stattfindet.